Established on the eastern Cycladic island of Tinos since 2011, Jerome Charles Binda did not come from a winemaking family, but was rather a graphic designer and an art dealer in his native France. 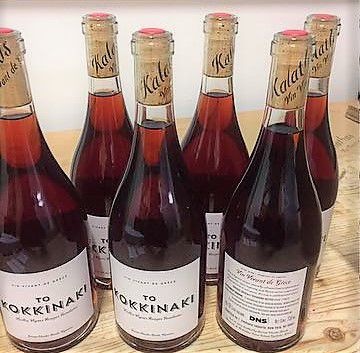 At the age of forty-five he decided to become a farmer and a winemaker, focusing on the extraordinary potential he sensed in the Tinian heritage grapes. 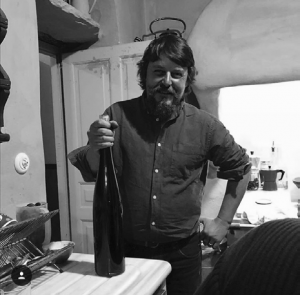 Following his intuitions and the good will of family and friends, he is now building, step-by-step, a domaine aiming to produce a rich palette of natural wines in an ever-learning attitude. There are no chemicals in the vine, no chemicals in the cellar, fermentations are spontaneous, and there no added sulfites. Jerome benefits from indigenous old vines as well as from a younger experimental and ‘franc-de-pied’ vineyard. Most of these vines are more than 150 years old, from varieties including native Aspro and Mavro Potamisi, Koumariano, G’durra (Kondoura or Tinian Mandilaria), and Rozaki. These are the core of Jerome’s heritage vines safeguard project – aiming at protecting and developing the Tinian traditional own-rooted “crawling” vineyards and supporting local activity in helping the young generation keep their heritage alive while building a sustainable future. Facing north-east to south-east on the slopes of the Falatados mountains, at an altitude of 320 to 400m, subject to very strong Aegean Sea salty winds, the vineyards are used to dealing with extreme weather conditions and a low amount of organic matter. On the other hand, they benefit from an unique geology and a striking balance between sunlight exposure and windborne freshness. Jerome’s commitment is to produce the finest expression of his non-phylloxeric granitic / sandy terroir, using manual techniques in the vineyards and the cellar. Organic-certified, he is building his own interpretation of biodynamics with patience and humility, according to the specific habitat of his vineyards: hand-harvesting and feet-treading before gentle vertical pressing, whole-cluster maceration, little temperature control, low-intervention winemaking in the cellar – all in an obstinate pursuit of healthy and self-sustained grapes in the vineyard. Domaine Kalathas produces white, rosé, orange, light red and deep red wines, fermented and aged in stainless-steel vats, as well as a few small cuvées in different types of clay vessels. Since 2016, everything is vinified and bottled with no added sulphur.